Christian Catalyst Collection: Alexander Solzhenitsyn -- The historic address Solzhenitsyn made on June 8, 1978 at Harvard where he stunned his audience and the elite American academic establishment with his scathing indictment of the West. 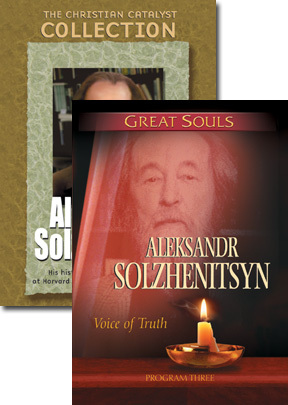 Christian Catalyst Collection: Alexander Solzhenitsyn -- He was heralded as a hero in the West for his courageous and gifted writings from prison that exposed the horrors and tyranny of Soviet Communism. But the reaction here was more subdued, at times even hostile, when he began to speak with equal candor about the sins and spiritual poverty of the West, most notably in a commencement address given at Harvard University on June 8, 1978. That address is the content of this video. The technical quality of the recording leaves much to be desired, but the power of his message, nevertheless, comes through with a poignancy and clarity that still challenges us today. Among his comments: "But should someone ask me whether I would indicate the West such as it is today as a model to my country, frankly I would have to answer negatively. No, I could not recommend your society in its present state as an ideal for the transformation of ours. Through intense suffering our country has now achieved a spiritual development of such intensity that the Western system in its present state of spiritual exhaustion does not look attractive." Great Souls: Alexander Solzhenitsyn -- Hailed as the greatest Russian writer of the 20th century, Aleksandr Solzhenitsyn went from avowed Communist to Gulag prisoner and outspoken advocate for the destruction of the Soviet empire. His writings exploded the myth of the Communist ideology and set the stage for the collapse of the Soviet Union. This hour long DVD, filmed on location across Russia, features Solzhenitsyn’s dramatic journey. With leading historians, friends, and observers, the program follows Solzhenitsyn’s dramatic journey across the turbulent years of Russia’s Communist experiment, and examines his spiritual odyssey that made him the champion of truth.